Last edited by TSelman61X on Sat Dec 29, 2018 1:49 am, edited 1 time in total. Last edited by TSelman61X on Mon Sep 24, 2018 4:10 am, edited 1 time in total. SirZephy wrote: however, these .wsp files/archives are at least 30MB large and are being converted down to 2-5MB audio files so I'm not sure if these .wsp files contain more than one audio file in them? yeah, they do. they contain multiple file headers. they probably need to be split first. edit: a quickbms script to do it. findloc NEXT_OFFSET string "RIFF" 0 ""
just select every wsp file when it asks you for source, it'll output every file's contents into separate folders. if you combine all the wem and wsp files into one using copy /b command, it'll be even easier. the single file that'll result from that will output everything inside of it in an ordered way into the same folder without any need for messing with moving, folders, files, filenames and such. after combining this with your stuff i got over 400 files out of it. So... Russian project is dropped. I've read the whole in-game text and corrected an enormous number of errors and typos. The team included those into the game and they do not want to do anything more. They don't share tools as well. And now I'm in search of any tools or people that can help me to finish the translation. I've read the thread and not clearly understand if the tools exist or there are only ripped pieces of code. I'm not a programmer so it is pretty tough. Now my friend is rewriting this https://github.com/micktu/att tool because it's bugged and works only in win8+. So I think this is not a problem. But I don't have ANY tools to work with the interface texts and fonts. 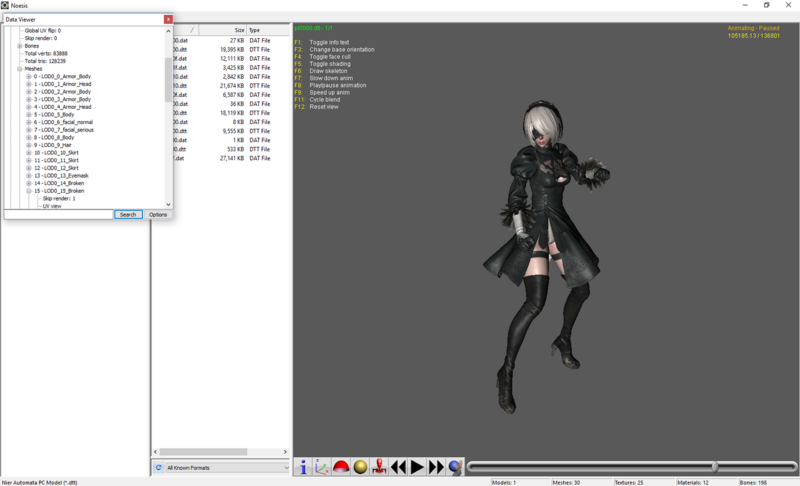 Thanks to delguoqing and DEElekgolo and everybody I forgot to mention (sorry about that) work on the model format I have implemented support for Nier Automata's model to my noesis plugin. It is including animation support as the animation format used is identical to Bayonetta 2. Notice that material are only texture + normal map for now. Is anyone still interested in modding this game? Also, to contribute here is a function I reversed from the game. Due to the large size of the archives, I hope someone can answer my question before I get started and potentially waste my time. Is it possible to import NieR Automata's maps, and if so how would I do so? Are the maps stored in the same format as rigged characters?